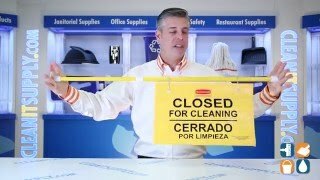 Durable, bright yellow, bilingual (English/Spanish on one side, English/French on the other). 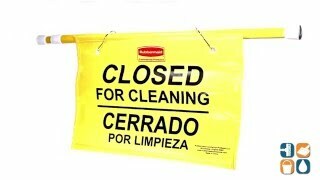 “Closed for Cleaning” imprinted hanging sign features torsion action to secure pole. Pliable construction offers ease of use and storage. Open, 50-1/4w x 13h; closed, 25w x 13h. 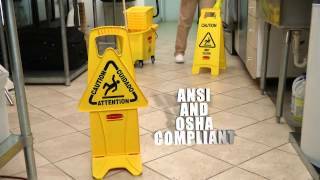 We use it during events so my staff can clean the restrooms and people relaize it is being done and stay out until it is safe to go inside. Some staff are males going into female restroom and vise versa.